Envirosystems Technologies has launched a new waterproofing solution based on their advanced cross-linking polymer technology for industrial, commercial and residential applications. 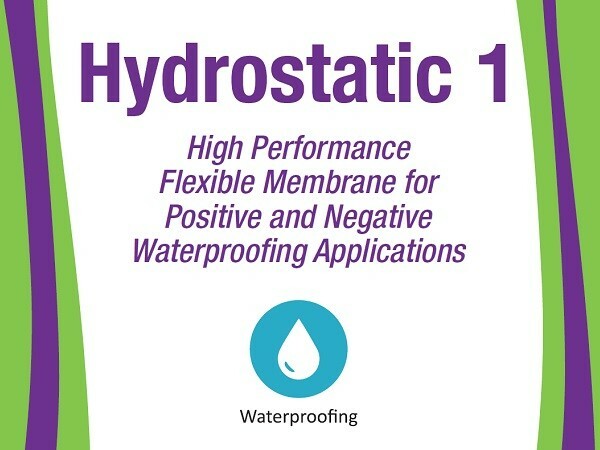 The new Enviro Hydrostatic 1 is a high-performance flexible membrane for positive and negative waterproofing applications. Water added to the Hydrostatic 1 powder forms a high-quality, liquid membrane system, which upon curing, provides a watertight membrane permeable to vapour diffusion. A single component, flexible polymer, modified cementitious membrane system, Enviro Hydrostatic 1 offers excellent freeze-thaw durability as well as adhesion properties. The water-based low VOC waterproofing product is suitable for immersion and underground applications, and can bond to damp surfaces without any primer application. Resistant to salts and carbonation, Enviro Hydrostatic 1 offers excellent vertical hold-up. Enviro Hydrostatic 1 is recommended for waterproofing basement walls, cellar walls, fish ponds, swimming pools and lift pits as well as for potable water containment. Envirosystems operates sales centres in New South Wales, Victoria and Western Australia, and has representatives covering Queensland, South Australia, Northern Territory, Tasmania, Asia Pacific and the Middle East.